The inscription I'm looking for is from the tombstone of ROZENCWAIG, Miriam , daughter of Jakob, wife of Meir, 1916, Reference 2020. On the first day of Sukkot that year, my father's grandfather came home from Shul and entered a communal sukkah. Another man took out a bottle of home-made liquor and my great-grandfather made kiddush. My great-grandfather's mother, Miriam, was the daughter of the Rav of Tomaszow Mazowiecki, and davened every day until noon from her siddur Korban Mincha. One day, during the shiva for her son, she fell while reaching for her siddur and broke her arm. This somehow became infected, and she died within the shiva of her son! It is her stone that I believe is the one you have listed. I'd love to see the rest of the inscription. Chaya Dobra (Reicher) Rosenzweig, widow of Zeideh Mordechai who died that Sukkot morning. Next to her is her younger daughter Zelda, who later married someone Kamincki whose first name no one remembers. She, her husband, and their two children were murdered by the Germans. Next to her is her brother Avraham/Adolf who was murdered with his wife Zilla (Karlinski) and their two daughters. 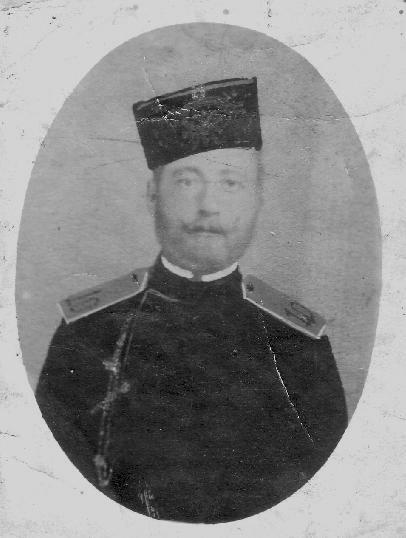 Next to him, seated, is his brother Yitzchak (Izzy) who survived with his (German convert) wife and daughter. 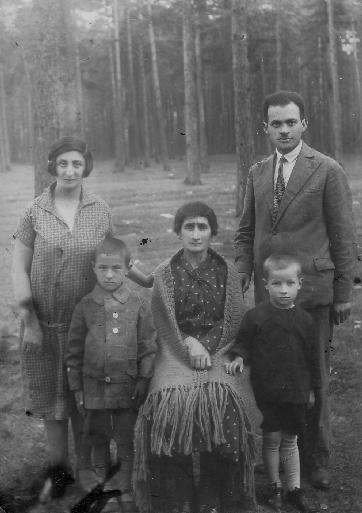 On the far right is my grandfather Nuta Nosson, who survived with his wife (Dina Rieder of Dukla) and two children, one of whom is my father. 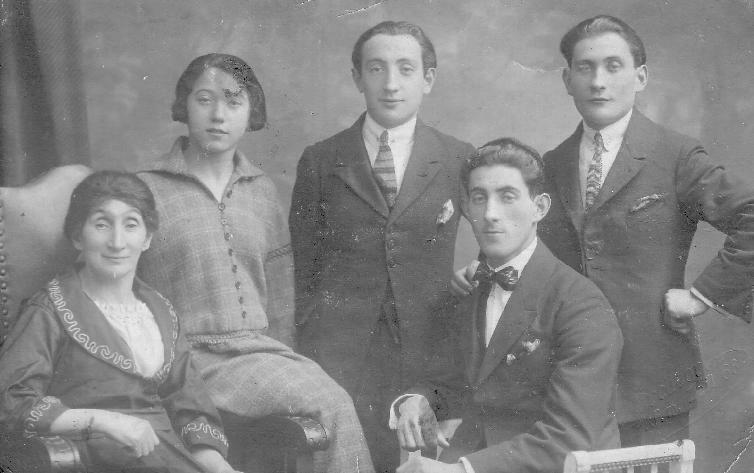 A photograph from just before the War, shows my grandfather's older sister Chava, their mother Chaya Dobra, Chava's husband Yosef Garbel (a Czestochowa watchmaker) and two of their six children. One of their children survived and was seen on Cyprus after the War, but never again. I would be most grateful to receive the booklet about Czestochowa Jewish cemetery when it's available. "And so, across the forests and fields of Poland, dozens of hamlets, whose names were once whispered in reverence and awe as gates to the heavens, have sunk into the anonymity of the Polish countryside." I have been haunted by this line since I read it years ago, and I think it is particularly appropriate to the work you are doing. May Hashem bless you for your work in preserving the memories of our relatives.